This reusable, vibrating ice therapy device treats muscles to relief two ways—and can help speed up recovery. Ice helps reduce swelling and soreness, while high frequency vibration can help boost circulation. Use both therapies at the same time or separately to target your aches and pains. Made in the USA. Dimensions: 9" x 7.68" x 2.75"
Good for quick solution and pain distraction. A waist of money do not buy this! We’re all about a two-for-one, which is why we’re fans of VibraCool's vibrating ice therapy. 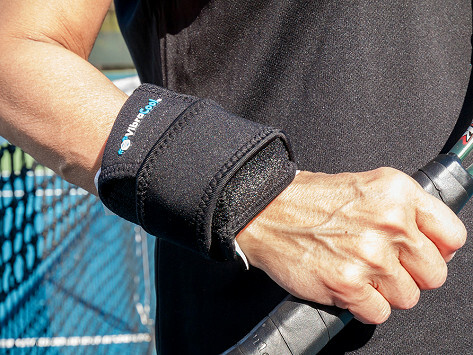 The device delivers two types of muscle relief at the same time in one wearable, reusable design. And it’s Made in the USA. It relieves muscle pain with cold therapy (which can help soothe inflammation and soreness) and high frequency vibration (which can help increase blood flow and stimulate recovery). And it comes in designs to suit common achy areas like the elbow, wrist, knee, and shoulder. Maker (and ER doctor) Amy Baxter created this icy and buzzy device while working to diminish needle pain in patients. She realized that the same approach would work just as well on sore and tired muscles. A VibraCool® session can last from 8 - 20 minutes. Use the ice and vibration as a recovery boost after a workout, or to get some relief from sore joints. Or try just the vibration to help you warm up before exercising. However you use it, you’ll get the best of both kinds of relief.